Swag bags. Every walk has them. Every carnival or community gathering where organizations are trying to say Thank you for joining the party has them. The Journey Home is no different…but I think our Swag bags are generously different! 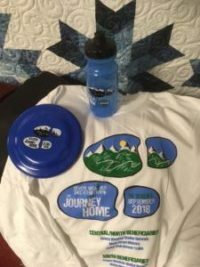 The first 300 walkers will receive a Swag bag with their completed registration form and walker fee. Each bag will include a walk t-shirt, a water bottle and a flyer. The value of these gifts are right around $35 all inclusive. Thank you to all our sponsors that made this Swag gift possible! Are you a teen or senior citizen who would like to walk with us? Register online today for just $20. Or you can register at the event. Either way…Swag bag as a Thank you for joining us. Are you an individual adult who would like to walk with us? Register online today for just $30. Or you can register at the event. Again…either way, Swag bag as a Thank you for joining us. Are you a family who enjoys doing activities together? Walk with us as a family of any size for just $40. Swag bag…yep. The kids will love the flyer. Cool water bottle for Mom and a shirt for Dad. When and where are we walking? Raise awareness around the realities of life on the streets. Check out our campsite exhibit and learn what camps are like for people living on the streets. Ask questions about what their real life experience is each day. Immediate volunteer connection with organizations making a difference in our community. Visit the Partner booths and learn about these organizations that all work together to address the immediate needs of people living on the streets, and then work along side of these brothers and sisters to encourage them in their Journey Home. Raise necessary funding for the 5 beneficiary organizations. A good idea, lived out with passion, is always a wonderful means to addressing challenging situations. The 5 organizations that are benefitting financially from this walk are passionate about working with and on behalf of people experiencing homelessness. Each one is addressing a specific need and provides encouragement and necessary support to people trying to get off the streets. We do not want to just talk about the problem. We are seeking to address it and clear a path in our community that allows individuals and families experiencing homelessness to make The Journey Home. It will take the community working together in unison to accomplish this very large task. Join us on Saturday for The Journey Home. Walk, visit, relax in the park and enjoy a meal together. It will be a great time of celebration! Can’t be there this Saturday, September 15th? Then join us Saturday, September 22nd! Our partners and I look forward to meeting and welcoming you. See you Saturday!